Local tourism businesses, tourism and community group members, as well as all other interested parties and individuals, are invited to take part in a series of workshops running from 12th-20th February across an area that takes in the Beara, Sheep’s Head and Mizen peninsulas as well as Dursey, Bere, Garnish, Whiddy and Long islands. The workshops will concentrate on pulling together stories, ideas, and opportunities that could be used to boost tourism in the area. They will take place during a week in which external consultants appointed by Fáilte Ireland will explore the region, meeting people, sampling experiences, and assessing ways to make it stand out as a particularly appealing destination on the Wild Atlantic Way. The Visitor Experience Development plan for the three heads will involve not just these external consultants, but also local authorities and the widest possible range of local tourism stakeholders. It forms part of a bigger process which is seeking to increase visitor numbers to the Wild Atlantic Way with a particular focus on increasing the time and money they spend in areas that have capacity for growth. The project is also seeking out ideas that will improve the range and quality of experiences available to our visitors. Similar plans have been developed successfully for the Skellig Coast and for the Burren and Cliffs of Moher, as well as for Connemara and the Aran islands. The Visitor Experience Development Plan will ultimately encourage continued growth in visitor numbers, dwell time and spend, helping to extend the tourism season and spread business across all parts of the region. Monday, 12 February: 4-6pm Grove House, Schull. Wednesday, 14 February: 4pm-6pm The Old Creamery, Kilcrohane. Thursday, 15 February: 7-9pm Garnish Room, Maritime Hotel, Bantry. Friday, 16 February: 3-5pm Eccles Hotel, Glengarriff. Monday, 19 February: 11am-12pm, Caha Centre, Adrigole; 12:30-1:30pm Beara Coast Hotel, Castletownbere; 7:30-8:30pm, Anam Cara, Eyeries. Tuesday 20 February, 7-9pm, Brook Lane Hotel, Kenmare. If you wish to attend any of the workshops, please confirm your attendance by emailing info@wordhoard.ie or calling 086 303 0991. If you can’t attend a meeting but would like to make a contribution to the discussion, you can phone or submit your ideas here! Glengarriff looks set to become the venue for the next West Cork parkrun with a public meeting to discuss the project planned for October 6th. The parkrun movement which began in London in 2004 has gained worldwide popularity in recent years, and almost 43,000 running enthusiasts have taken part in weekly timed 5k runs in Ireland since the events were launched here in November 2012. The proposed run route in Glengarriff is located within the village’s nature reserve, and the project is being explored with the support of both the National Parks & Wildlife Service and the national parkrun co-ordinator who will be present at the public meeting on October 6th. If the planned parkrun gains local backing and full approval, Glengarriff will join the growing list of Cork locations where runners, joggers, and walkers can take part in the popular weekly timed runs each Saturday morning. Successful events are already well-established in Macroom and Clonakilty, as well as on nearby Bere Island which celebrated its first parkrun anniversary in August with a visit from Declan Kidney. Cork city’s first event was launched on September 26th, and the parkrun movement in Ireland is clearly picking up pace. For further information, contact Nuala Carey at 027 63744. Inaugural National Tourism Awards 2015. West Cork’s Sheep’s Head Way made its presence felt at the inaugural Irish Tourism Industry Awards with a string of special accolades going to members of its tourism co-operative. 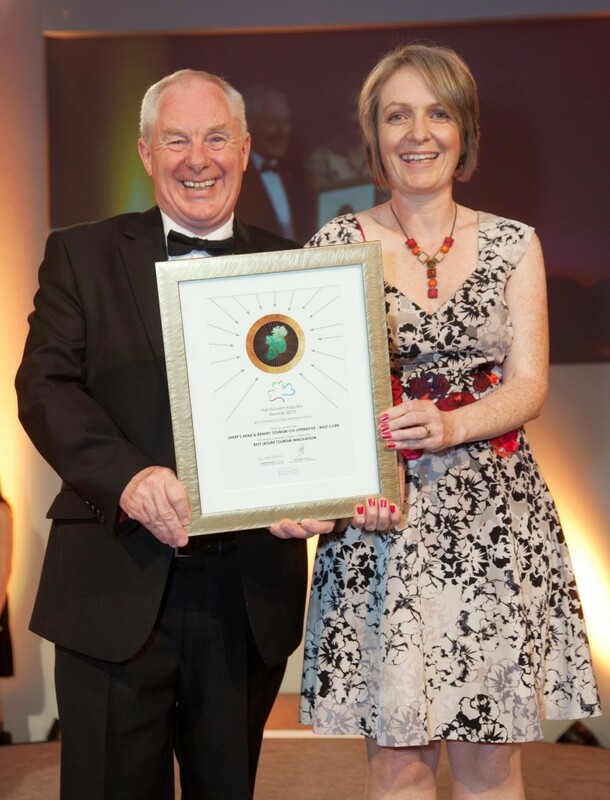 The national awards were presented in twelve categories, and Guinness topped the Best Leisure Tourism Innovation category in which the Sheep’s Head’s & Bantry Tourism Co-operative was shortlisted. However, the judges – including travel journalist Pól Ó Conghaile and representatives of Primark and Google – went on to award one of just three special judges citations to the co-op for its outstanding work on its “Living the Sheep’s Head Way” promotional campaign. David and Elizabeth Ross won a special judges citation for the Top of the Rock Pod Páirc and Walking Centre, their glamping site and walking business in Drimoleague. Meanwhile, a brand new West Cork business, Shoeniversity, won a bursary in recognition of the exciting work it is doing in creating designer shoes, and offering shoemaking courses, in the stunning setting of Bantry House. “The late Tom Whitty, along with Jim Leonard and James O’Mahony, set us a powerful example of what can be achieved when people collaborate,” she added. “Their imaginative, community-led approach was recognised when the Sheep’s Head was designated as a European Destination of Excellence for sustainable tourism in 2009, and everything we’re doing now continues to be inspired by their example. “One of the great things about this latest award is that it shows that the kind of responsible tourism represented by the Sheep’s Head Way is great tourism by any standards. The award is yet another accolade for ‘Living the Sheep’s Head Way’, which has been supported by both the West Cork Development Partnership and Cork County Council. The Sheep’s Head won Silver in the ‘Best Responsible Destination’ category at the Irish Responsible Tourism Awards in March, and was also named as ‘Best Destination of the Year’ by the prestigious John and Sally McKenna Guides this January.